Beattie, Robert, passed away peacefully 14th April 2019. Loving husband of Arlene, cherished father of Laura, Wendy, Carol-Anne, Gary and Dean. Devoted grandfather and great-grandfather to all his grandchildren and great-grandchildren. 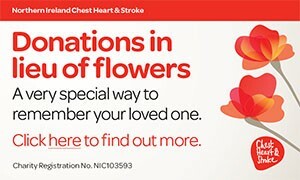 Family flowers only please, donations in lieu of flowers to Northern Ireland Chest, Heart & Stroke 21 Dublin Road Belfast BT2 7HB. Funeral service will be held on Friday 19th April 2019 at 11:00am in Wilton Funeral Home, 298 Shore Road Whitehouse BT37 9RW and followed by a short committal service at 1:00pm in Roselawn Crematorium. I am sorry to tell you that Robert BEATTIE has passed away.